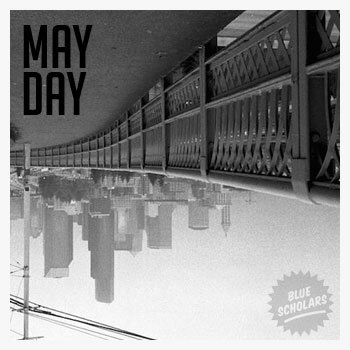 Blue Scholars – "May Day"
Geologic aka Prometheus Brown aka the Emcee from Blue Scholars has frequently been labelled as more of a poet rather than a rapper, often because of his extremely concious state of mind with subject matters ranging from immigration, war, struggle and (which his new track "May Day" is about) street violence. The Seattle Times reached out to Geo to speak on the recent gun violence that has broke out in Seattle. The rapper hit them back with the track "May Day" which specifically addresses the violence the reporter referenced. The song features the other half of Blue Scholars, Sabzi, who provides a very moody, lo-fi sounding beat coupled with a stressed piano riff that would fit right into Enter The 36 Chambers. Then we have Geologic on the mic spitting some truthful and slightly controversial lyrics; however, those types of lyrics are almost expected from him. Geologic definitely lives up to his reputation on this track. If you're interested in grabbing the instrumental for this great track you can pick it up off of Sabzi's Bandcamp page HERE. Every song is sicker than the last without fail reppin Seattle Hip-Hop!! Boys Noize drops 2016 recap video feat. new remixes of "Starchild" & "Euphoria"